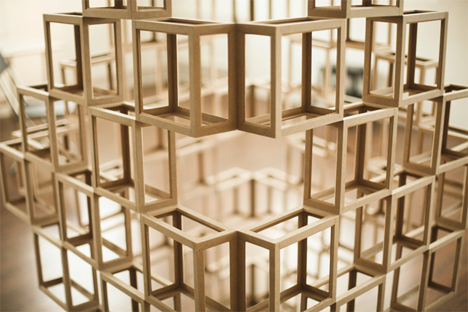 These simple wooden cubes look a little boring, but when you see what inventor Erik Aburg does with them, you’ll be shocked. The cubes move around under Aberg’s expert direction, folding and rolling into seemingly impossible configurations. Their movements are as fluid as if he were manipulating paper. 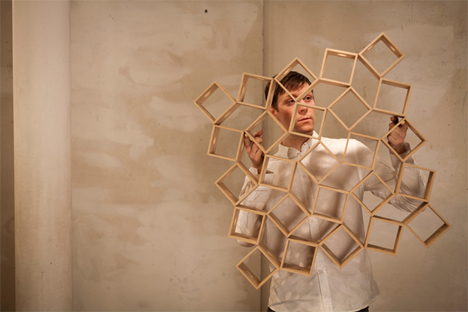 Aberg’s love of juggling inspired him to create the crazy-interesting Ghostcubes. He previously worked with juggling balls, but after seeing an origami artist’s work with interlocking paper cubes he decided to use a similar object as a way to liven up his act. Each Ghostcube set can take up to a month to produce from planning and design stages through completion. They have to be carefully folded and attached in order to provide the kind of fluid motion that makes them so mesmerizing to watch. Aberg’s act sometimes involves balancing and rolling balls along the Ghostcubes as they change shapes, which kind of blows our minds. See more in Do It Yourself or under Technology. March, 2014.